If you want to install new outdoor lighting at your commercial or residential facility or want to retrofit your existing system, you'll be interested in our outdoor lighting service. Saluppo Landscaping will design and install lighting you need for parking, security, general illumination or enhancing the beauty of your home or business. Most of us are concerned with the way our homes look. Each day is a new opportunity to refine, tune up and simply appreciate the appearance of our surroundings. That doesn't have to change when the sun goes down. In fact, during the nighttime hours you have a new kind of control over the way your home and grounds appear. You can illuminate just what you want, with the intensity that suits your mood. It's not only the shapes and objects that make up your outdoor environment, it's also how you choose to make them visible. 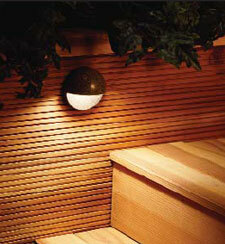 And with today's low-voltage exterior lighting systems, lighting up your night is easier than ever. Of course, creating an interesting visual nightscape around your house isn't the only reason to consider exterior lighting. 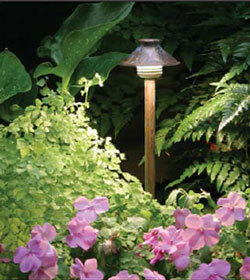 Properly placed fixtures can increase the safety and usefulness of paths, steps, entrances and driveways. Plus, exterior lights can contribute to home security.